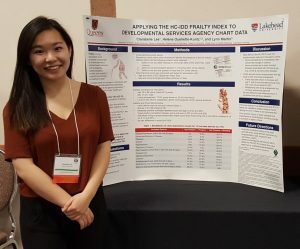 Congratulations to Clarabelle Lee, BSc Life Sciences student at Queen’s University and MAPS trainee, who completed her undergraduate thesis advancing our work on frailty and IDD. She presented her research at the 2018 OADD RSIG Day held in Kingston on April 7. You can view her poster at https://bit.ly/2EQxt8t. 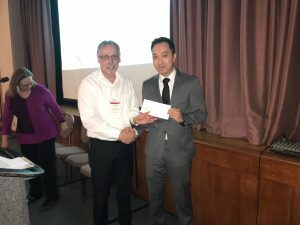 Congratulations to MAPS/Queen’s-based trainee Stephen Lam who was awarded an OADD – NADD Ontario Scholarship. Stephen’s MSc thesis research examining quality of primary care provision to older adults with IDD will include a focus on co-occurring mental health needs in this population. The award was presented at the OADD conference held in Kingston. Congratulations to Robyn Saaltink who successfully defended her PhD thesis in Sociology at Queen’s University titled “Passports to Adulthood, Strong Families and Good Mothering: A Critical Examination of Developmental Disability Discourse in Ontario Between 2008-2014”. Robyn’s research relied on interviews with parents who participated in MAPS research as well as review of policy documents and Select Committee transcripts. A summary of the research will be available shortly.